Change is in session! DevOpsDays DC will be held June 8 and 9, 2016 at the US Patent and Trademark Office in Alexandria, Virginia. You have a great story and we want to hear from you! Submit a proposal for a presentation in our CFP. Proposals from speakers who work within 100 miles of Washington, DC will be given a higher priority. CFP closes Monday, April 18, 2016. Tickets are on sale now for both Government and private sector employees ($100 each). Please register early as this event will sell out. 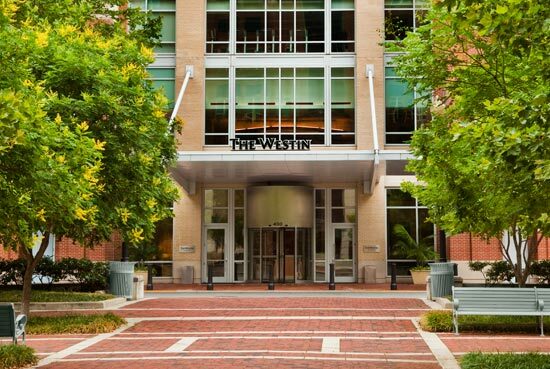 Reserve your room at the Westin Alexandria in the DevOpsDays Room Block for $249 per night. DevOpsDays is a self-organizing conference for DevOps practitioners that depends on your sponsorships to happen. We have three different sponsorship levels available. The organizing committee is working on arranging the schedule. At a high-level, each day will consist of a mix of keynote presentations, ignite presentations, and open spaces. There will be at least one evening activity for all participants scheduled for the evening of June 8. Whether you're in government, academia, or the private sector, DevOpsDays is for you. Whether you're in operations, development, QA, security, or any other department, DevOpsDays is for you. If all you know of Washington, DC is what you see on C-SPAN or House of Cards, you're missing out. While its importance as the Nation's Capital and center of government is undisputed, the "DMV" (District, Maryland, and Virginia) is also home to innovative startups, leading universities, and world-class arts and culture. If you're local, you already know the diversity of our DevOps community. If you're coming in from elsewhere, prepare to mix with DevOps leaders from every segment of our vibrant local scene. And, of course, take some time to check out everything else the Nation's Capital has to offer, from the many free Smithsonian museums to great food and drink! For those coming from out of town, there are flights from just about everywhere to our three local airports, and there are several hotels nearby. More details are on the location page.